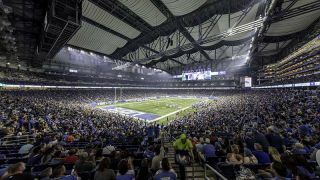 A 178-loudspeaker Meyer Sound LEO Family linear reinforcement system is the keystone audio component of a $100-million off-season renovation of Ford Field, the 65,000-seat enclosed stadium that hosts home games for the National Football League's Detroit Lions. The new audio system—designed and built in Berkeley, CA—is designed for exceptional speech intelligibility with uniform coverage throughout the seating bowl while also delivering the broadband power and dynamic range required to energize fans in the stands and players on the field. The Lions' renovation project marks the first permanent installation of a LEO Family system in any NFL stadium. "I think our fans will be blown away by the sound this season," said Todd Argust, vice president of operations for the Detroit Lions. "There is no place in the venue where you won't be able to clearly hear all the play announcements and calls by the officials—which unfortunately was not the case with our old system. It also will be a valuable tool for getting our fans pumped up at critical points in the game, so ultimately it will help the Lions perform at their best here at Ford Field." Using the same loudspeaker components as touring concert bands such as Metallica, the LEO Family system possesses the wide dynamic range required to deliver clean, uncompressed and undistorted sound even during bursts of peak ambient crowd noise. Because the voice characteristics remain clear and natural, intelligibility remains high without sounding annoyingly loud. Extended dynamic range also enables greater flexibility in programming music and effects for climactic moments as sound doesn't have to be heavily compressed to prevent system overload. “We really needed to get the sound quality up to where the fans could clearly hear the calls from the field and enjoy the music during breaks,” said Detroit Lions president Rod Wood. “In that respect, I think we've gone from near the bottom of the NFL right to the top." Argust is pleased that the optimum audio solution for Ford Field came from a company that is American-owned and still manufactures all products in the USA. "Having a system made in America was important symbolically," he said, "but it was even more important logistically. Because of our accelerated construction schedule, we needed a vendor that could respond quickly and have the system ready on time with zero performance compromises. We found that with Meyer Sound." The main bowl system is anchored by a distributed ring of eight LEO Family line arrays, with a total of exactly 100 LEO-M and LYON-M self-powered, full-range loudspeakers covering the majority of seating areas. Augmenting the main arrays are scoreboard delay arrays and corner-fill arrays with an additional total of 36 LEOPARD compact linear loudspeakers. Bass power is propelled through 24 1100-LFC low-frequency control units, here deployed as cardioid arrays to provide directional control and maintain tight response for convincing impact both in the bowl and, when a special preset is selected, also on the playing field. A separately addressable system of 18 LEOPARD loudspeakers blankets the playing field with high-level sound. The entire system is controlled by 11 Galileo GALAXY networked processors and monitored via Meyer Sound's RMS networked monitoring system. Outside the main seating bowl of the stadium, in the acoustically problematic atriums at gates A and G, audio is delivered by Meyer Sound CAL column array loudspeakers with advanced beam steering technology. Bass is supplied by two 500-HP subwoofers. The CAL systems provide enhanced intelligibility in these challenging areas. Another key member of the Ford Field AV renovation team was Josh Beaudoin, a principal at the Dallas-based consulting firm of Wrightson, Johnson, Haddon & Williams (WJHW), a worldwide provider of AV design for sports facilities. "I basically served as the owner's representative, helping with product decisions, monitoring construction, keeping everything on schedule, and ensuring overall value,” Beaudoin said. “In regard to audio systems, I helped the Lions evaluate quality, USA sourcing, ability to meet the accelerated schedule, and the relationship they were looking for over the life of the system. Meyer Sound checked more of these boxes than any other supplier." Also sharing credit for the new audio system, alongside WJHW and Meyer Sound's design services department, is system integrator Parsons Electric of Minneapolis. "Over the years Parsons has proven to be a very good partner for many other professional sports teams, and we are always pleased to work with them," Beaudoin said. "We can be confident the job will be done right the first time." Parsons also installed most other components of the complete AV renovation, including new USA-made LED video boards by Daktronics. Construction of Ford Field was completed in 2002, and in addition to NFL games the venue also hosts concerts, motorsports, collegiate sports, and community events such as graduations.